Postion the computer display side up. 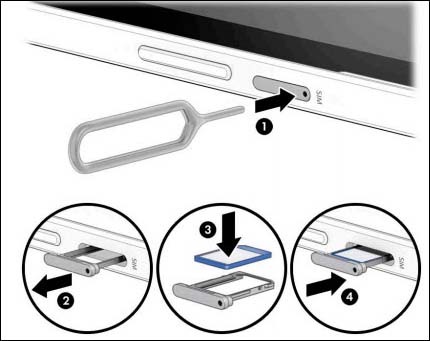 Utilize the card removal tool (or paperclip) to unlock the tray by inserting it into the provided slot (figure 1) then remove the tray (figure 2). With the gold contacts facing down and the notch located in the upper-right, insert the SIM card into the tray as shown. Asegúrate de que la tarjeta encaje en su lugar. Inserta la bandeja de la tarjeta SIM. Empuja la bandeja hasta que se trabe (figura 4).